The potholes on the roads can lead to extensive and costly repairs if you are not careful when driving. You will want to make sure that if you see a pothole, try and avoid it. You will also want to be aware of any traffic or people around you. Do not swerve from hitting a pothole if it increases the chance of an accident by going into another lane. It is hard to determine the depth of a pothole as well. Sometimes the pothole may be shallow, while other times it may be deep. If you do have to hit a pothole, make sure you approach it at a slower speed. This will allow you to go slowly over the pothole to help avoid damage and issues to your vehicle. If you do hit a pothole, make sure to check your vehicle over as soon as you stop. This should include checking the tires, rims, and overall condition of your vehicle. Depending at the angle and speed you hit a pothole at, there can be significant damage done to the vehicle. You will want to make sure that the tires do not have any damage to them. This will also include making sure there are no bulges to the sidewalls of the tires. If there is a bulge, it can increase the chance of the tire blowing or an accident. 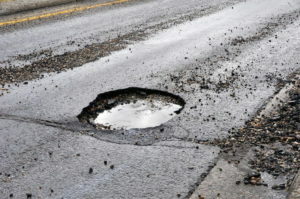 Whenever hitting a pothole, always make sure to contact us and schedule an appointment. 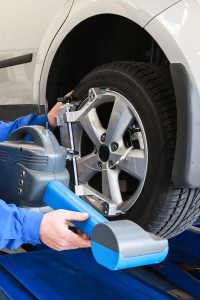 This way we can inspect the vehicle for you to help ensure the tires and vehicle are in the best condition possible. If there is an issue, you will want to have it fixed as soon as possible so it does not cause further damage to your vehicle. By having the vehicle inspected, you can increase the safety as you drive. 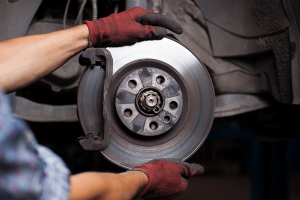 Proper maintenance and brake care is always important for your car. No matter what time of the year it is, regular inspections should be followed. This will help to make sure that your vehicle can operate efficiently when you drive. If there is an issue with the vehicle, having it inspected can help decrease the chance of it becoming worse in the long run. Remember to never ignore issues or regular maintenance. Ignoring the problem will only cause it to become worse with time. This will also result in a costly repair bill, as well as other parts starting to wear and fail. The brake system for your vehicle should be inspected on a regular basis. The brakes are made up of several parts that will work together in order to stop the vehicle. The brake pads, brake rotors, brake fluid, and other parts will need to be inspected each time the brakes are fully checked. When the brake pads start to wear out, then the brake rotors will wear down as well. You might notice this by any odd noises that occur. A squealing noise or sound that sounds like it is metal to metal can indicate an issue. You will want to also make sure that there is enough brake fluid in your vehicle before you drive. If there is not any brake fluid, then the brakes will not respond when you apply the pedal. You may also have brake fluid that leaks from the vehicle as you drive or apply the brakes. The best thing that you can do is bring it in for us to look at it. Also make sure you are aware of how the vehicle handles, and if anything is out of the norm with it as you drive. The tires are an important part of your vehicle to inspect. There are a few things that you should look at. Make sure they are properly inflated. If a tire is too low, it has a greater chance of blowing out. When a tire is over inflated, then it is more prone to pick up sharp objects on the road. The vehicle owner’s manual can advise you on how much air each tire should have. You can also contact us and we can advise you on the amount as well. If you are unsure about the air pressure reading, you can also schedule an appointment and we can inspect it. Also you will want to check the tread of the tires. The tread will help grip the surface of the road as you drive. This results in good handling of the vehicle. If the road is wet or slick, you will want good tread so you can keep control of the vehicle. If you start to notice the vehicle swerves, check the tread. Take a penny and place it upside down in the groove. If you see the top of Lincoln’s head, then the tread is too low. If you notice uneven tread wear, then a tire rotation can be beneficial. This will help make sure that the tread is wearing evenly all the way around the tire. Another important thing is to check the tires for any bulges or cracks. If the tires have hit something, you may notice a bulge starting to form on the sidewall. This can eventually lead to the tire blowing out and resulting in an accident. If you notice any issue, make sure to bring the vehicle as soon as possible so we can inspect it for you. As you drive, always make sure that you can see as best that you can. This will help you to be aware of any other drivers, objects, and the road. The windshield will need to be inspected carefully. Make sure it is free of any cracks or chips. A small crack or chip can eventually lead to a larger and much worse one. A crack may only be tiny now, but eventually it will start to expand. In some severe cases, it will cover the length of the windshield. This will then make the windshield weak. As it gets weaker, it runs the risk of a danger to you and your passengers. Remember not to push or touch the crack or chip, as sometimes this will make it worse. Another part that helps your visibility are the windshield wipers of your vehicle. If there is any precipitation or road grime on the road, the wipers will help remove it from the windshield. If the wet debris dries, you will have marks on the windshield that impairs your visibility. 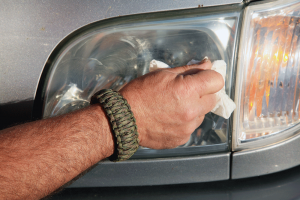 Having the windshield wipers operate will help remove this and help you see better. If you notice that the wipers are not cleaning or clearing away efficiently, it may be time for new ones. Over time the wipers can deteriorate and will need to be replaced. If you are not sure what windshield wiper to buy or you are having problems replacing them, we can do that for you. The rear windshield wiper should also be inspected. This will clear the rear windshield so your visibility is good as well. Most times it is often forgotten about, so make sure to check it. This will also improve the visibility if you need to see behind you quick or back up. Your vehicle will have to be in the best condition in order to operate at top efficiency levels when you drive. When you go to regular maintenance inspections, we can inspect the parts and components for you. Having a bumper to bumper inspection is important for the overall condition and efficiency of your vehicle. Between visits, make sure to be aware of anything that might be out of the norm for your vehicle. This could include noises, smells, or even how the vehicle handles when you drive. Make sure to schedule an appointment when you notice something, that way we can repair it as soon as possible. You will want to remember to have the oil changed based on the schedule. The oil will lubricate the engine so it operates smoothly and efficiently. The engine needs oil so it can move and operate smoothly with the gears. Without oil, the parts will wear and cause strain against one another. When this happens, it can do damage to the engine. You may also notice odd noises or grinding sounds from under the hood. Make sure to never let the oil get too low or empty, as this causes the engine to fail. Now is a great time to do an inspection of the tires on your vehicle. The tires should be free of any damage, bulges, or uneven tread wear. Check the inflation so they are all at the proper amount. If a tire is too low, then it can increase the chance that it blows. Also remember to check the tread wear of each tire. Sometimes you may notice uneven tire wear. If this is the case, then a tire rotation could be beneficial. This rotates the tires so that other parts of the tread can wear down for you. No matter what question you have about the vehicle or tires, make sure to contact us. Winter roads can become hazardous quickly. As the months go on, so does the build up of snow and ice. When it is scraped off or removed, those piles will start to get high as well. Each snow storm can result with a drift that continues to get larger. When this happens, you will notice that the visibility when you take corners will decrease as well. Make sure that you adjust your driving, and take it easy when on the roads. If you cannot see anyone, they cannot see you as well. So make sure to be safe so you can reduce the chance of an accident. When taking a corner or at an intersection, you might encounter a snow pile that is a few feet high. This will more than likely impair the visibility for you and other drivers. If you are turning, make sure to do so slowly. Inch ahead just slightly until you are able to see the traffic that you are driving in the same direction as. If you shoot out into the road, you increase the chance of an accident, because other drivers will not see you. Remember to drive with your lights on as well. Having the lights on can reduce the distance that others might be able to see you at. It will reduce the chance of any collision or accident occurring when you drive. If you hear any odd noises or sounds from your vehicle, you will want to make sure to schedule an appointment with us, so we can inspect it. Anything out of the norm should be taken care of as soon as possible before it becomes a larger problem. This will help you to save time, money, and stress in the long run. The lights of your vehicle are a very important safety feature. Without the lights, you will not be able to see when you drive. There is also a problem because it may result in others not being able to see you as well. When it starts to get dark or if the weather is poor, make sure to turn on the lights for your vehicle. A good rule to follow is if the wipers are operating, then turn on the headlights for your vehicle as well. If you are not sure if they are in the best conditions they should be in, schedule an appointment. You can bring the vehicle in and we can inspect the lights for you. Remember to turn on the signals a few seconds before you plan on turning. This is needed because those around you will be able to know what direction you are going to turn. If a signal does not work, then the chance is increased that they might run into you. Driving as safe as possible is important, so adjust your speed based on the road conditions as well. If they are less than ideal, then you will want to slow down. This will help you to remain in control of the vehicle when you drive. If you start to slide, remain calm and regain control of the vehicle. Over correcting the steering wheel could cause you to go in the ditch. Make sure that the headlights are aimed properly. They should be aimed so you can see in front of you, but do not blind any oncoming traffic. If the lights are aimed poorly, bring it in so we can adjust them for you. This can improve visibility and safety as well. With winter weather comes colder temperatures. You will notice that the tires may decrease with air pressure quicker than they do the rest of the year. This is because for every ten degree drop in temperature, the tires decrease air pressure. The tires could lose as much as one pound per square inch of air pressure. When the tires get low on air, you can run the risk of them blowing out when driving. Make sure that you check the tires on a regular basis. If they are low, you will want to fill them to the correct amount recommended in the manual or by us. If the tire continues to go low often, you will want to make sure to bring it in so we can inspect the tires for you. No matter if you are traveling a few miles, or a few hundred miles, you will want to make sure the tires are in the best condition possible. Checking the air pressure is the first step in doing so. 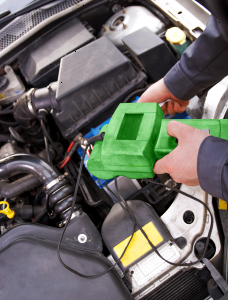 If you are on the road and notice the tires are low, most gas stations will have an air pump you can use for free. You will never want to drive on a low tire. Besides risking the tire blowing out, you can also cause other damage. The rims could become bent and be damaged if you choose to drive on a tire that is low. Preventative maintenance can help to decrease the chance of an unexpected low tire. Another thing to remember is to check the spare tire. If a regular tire becomes damaged or blows out, you will have to rely on the spare tire to get you safely to your destination or home. Spare tires should also be inspected for their overall condition, so you can ensure you can use them if you need to. When you are driving, you will want to always drive as safe as possible. 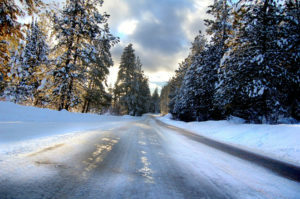 In the winter, make sure you take the proper precautions when driving on roads that are less than ideal. The first thing to do is to drive slowly on the roads. Doing so will help you to keep control of the vehicle when the roads are ice or snow covered. Driving at a speed that you are comfortable at will help to increase the safety when you drive as well. You will want to leave plenty of space from the vehicle in front of you. This will help to be prepared if the vehicle in front of you has to stop suddenly. It will allow you more time to brake as well. Always make sure to be aware of those around you too. When you get ready to drive, make sure that you check the tires. You will want to make sure that there is enough air in them. Tires that are over or under inflated can be more prone to damage. Having the proper amount of air in them will help them to provide a comfortable ride for you. In the winter, tires can loose air pressure quicker than the rest of the year. Since this happens, always make sure to check the tires frequently. Also you will want to check the air pressure before you drive, or awhile after driving. If you check it right after driving, the tires are warm and can provide a false reading. Also, remember not to slam on your brakes on ice. Doing so can result in the vehicle sliding or not being able to stop properly. Instead, you will want to pump the brakes in order for you to stop properly. If you know a stop sign or stop light is coming up, start slowing down before you get there, so you are able to stop and avoid an accident. There are several things that you should inspect on the vehicle when the winter temperatures become cold. The fluid levels should be checked. This includes the oil, brake fluid, transmission fluid, and other fluids under the hood. When the temperatures get below freezing, you can increase the chance of a hose cracking or becoming damaged. You will want to bring the vehicle in so we can properly inspect the vehicle, belts, and hoses. When a hose is damaged, the fluid will leak out of it. Another important thing to inspect are the tires of the vehicle. These are the only part that will make contact with the road, so it is important they are always in the best condition possible. Make sure to check the air pressure of each one. If the tire is low, make sure to fill it up as soon as you can. This will help the vehicle to be efficient, as well as keeping the tire last as long as possible. Tires that are lone can be more prone to blowing out. Remember to check the tires before you drive, or after some time when you are done driving. Sometimes the tires can give a false reading if you test it after driving. If a tire is leaking air often, bring it in so we can inspect it for you. Also remember to check the windshield wipers. You will want them to be free of ice and snow. If not, the wipers can scratch the windshield when you turn them on to operate. 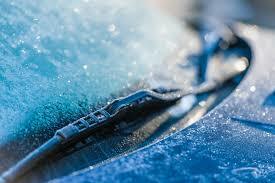 It is ideal to start your vehicle to let it warm up before you drive. This can help to warm up the windshield, making it easier to remove any snow, ice, or frost build up on it. 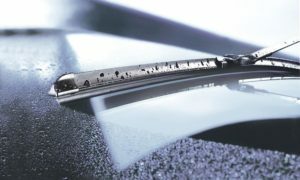 If the wipers are damaged, make sure to have them replaced as soon as you can.